To celebrate the 20th anniversary of the movie Predator, a detailed replica of the machete used by Dutch Shaefer (played by Arnold Schwarzenegger) and his commando squad was released in a limited production run of 10,000 pieces. This is not one of them. 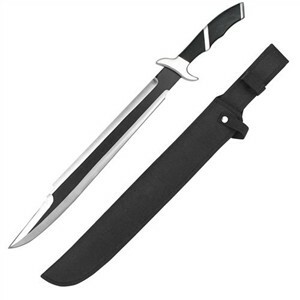 Built narrower and lighter than the signature version of the Predator Machete, this less expensive reproduction still packs a lot of steel into a nearly accurate 24-3/4-inch machete/short sword. As with the limited edition knife, the upper edge is ground but not sharpened. The cutting edge may not be absolutely symmetrical, and don't expect the black paint on the center of the blade to be permanent. Some of the decorations here are only temporary if the knife is put to use. Even so, the knife's blade may hold up well enough to light chopping. There's enough 440 high carbon stainless steel in this machete to do some actual work -- just expect to resharpen the edge frequently. The handle design matches the movie weapon fairly well, but the workmanship here is more delicate. Polished metal bolsters and pommel should hold up, but the hardwood slabs installed between them aren't shockproof. Machetes focus a lot of force in the handle if the blade comes up against something solid. Broken grips and numbed fingers are common enough even with machetes made for heavy work. The nylon sheath will last a while if used with care. The Predator Machete isn't quite good enough for display, but it could still find a place in the toolkit.